Want a closer inside look into What’s In the Bible? curriculum…it’s just a click away. As you explore the What’s in the Bible? series and church curriculum, we invite you to take a week out for a test run. With a click below you can download one free week of materials – print and video – that you will need to lead a Sunday School class, kids Bible study or a Wednesday Night gathering. 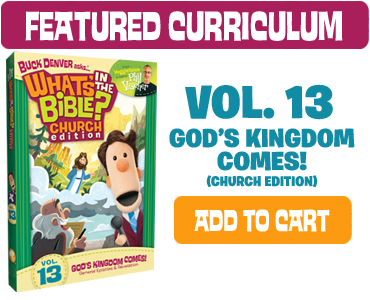 Each volume of curriculum contains 4 weeks of Sunday school materials – videos, activities, discussion questions, crafts/games and take home material. When you start using What’s in the Bible?, it’s completely flexible to make your Sunday School lessons unique for your church and classroom.The free sample week below is Week 1 from Volume 10 – Jesus is the Good News! [Matthew, Mark, Luke & John]. With a first look into the time between the Old Testament and the New Testament, this week begins the journey of Jesus’ life, death and resurrection – Good News indeed! Download the free sunday school lessons below and we hope you find them a great fit for your kids Bible study or Children’s ministry. You can get a free one-week sample by visiting our Curriculum Information Page.